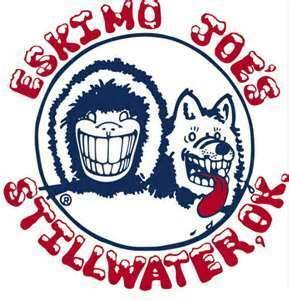 The world famous Eskimo Joe's logo was drawn by Epsilon Epsilon Brother Mike Staubus (EE 1431). A former Regent of Sigma Nu Fraternity, Brother James Bradley and his High Council are responsible for returning Sigma Nu Fraternity's National Headquarters back to Lexington, Virginia in 1957. The seven and a half acre plot purchased was a historic step for Sigma Nu, since the land originally belonged to the son of General Frances H. Smith, the man who inspired James Frank Hopkins to found Sigma Nu. Located on the highest hill in corporate limits of Lexington, the home was ideally suited for conversion and development and Brother James Bradley is credited for contracting renowned Virginia Architect Milton L. Grigg (participant in the famous Williamsburg Restoration) to restore the home. Thanks to his commitment to Sigma Nu, the headquarters were dedicated in 1960, and remain there today. Brother Bob Fenimore was a halfback for the Oklahoma A&M football team from 1943-1946. Known as the "Blond-Bomber" He was OSU's first two-time All-American and partly responsible for OSU's only unbeaten season that occured in 1945. As a college player, Brother Fenimore finished third in the Heisman voting and led the nation in rushing with 142 carries with 1,048 yards in 1945. He broke numerous school records including the most interceptions which he still holds today at 18. In 1947, he was the first overall pick in the NFL Draft by the Chicago Bears. In 1972, Brother Fenimore was inducted into the College Football Hall of Fame and in 2007 he was inducted into the Cotton Bowl Hall of Fame. Brother Neil Armstrong was a football player for Oklahoma A & M before being picked 8th overall in the first round of the NFL Draft in 1947. He was picked by the Philadelphia Eagles where he won two NFL Championships in 1948 and 1949. Brother Armstrong concluded his career as a player in the early 1950s for the Winnipeg Blue Bombers. After playing, Brother Armstrong was picked up as an assistant coach for the Houston Oilers in 1962. After serving two years on the Oiler's coaching staff he headed back north as head coach of the Canadian Football League's Edmonton Eskimos. He was then hired by the Minnesota Vikings in 1970, and became an integral part of developing the team's dominating defense. After helping the team reach the postseason in all but one of the next eight years, he was hired as head coach of the Chicago Bears on February 16, 1978. He held the position for four years before beginning the final leg of his professional coaching career as an assistant coach for the Dallas Cowboys. Mr. J. Berry Harrison is Director of Southwest Bancorp Inc. Southwest Bancorp Inc. is the bank holding company for Stillwater National Bank and the Bank of Kansas and has reported assets in excess of $2.8 Billion. It's branches can be found throughout the states of Texas, Oklahoma and Kansas and it is publicly traded on NASDAQ. On top of managing a such a large bank, Brother Harrison has many other achievements. He is a retired Oklahoma State Senator and has been a rancher and farmer in Fairfax, Oklahoma since 1962. Mr. Harrison serves as Conservation District Director of Osage County, President of the Oklahoma Association of Conservation Districts, and is a member of many other civic groups. J. Berry Harrison has made many contributions to Osage County, Sigma Nu, Oklahoma State University, and the state of Oklahoma. Brother Bill Spears is the founder Cenergistic, formerly Energy Education, Inc., a Dallas based company that develops and implements energy conservation programs that enable schools to redirect funds toward educational needs. Cenergistic, which started in 1986, has helped public schools and other organizations save more than $1.3 billion. It is recognized as the only people-based energy conservation program of its kind. Brother Spears is also commonly known for the generous endowment to his Alma mater. The endowment given in 2004, was an undisclosed donation to the Business School in which the University recognized him by naming the Spears School of Business in his honor. In 2005, he was inducted into the Spears School of Business Hall of Fame. To add to his more recent accomplishments, Brother Spears contributed $1.5 mil to the Sigma Nu Educational Foundation and challenged all Epsilon Epsilon Alumni to match his pledged donation. As a result of this successful campaign the carriage house in Lexington, VA will be renamed "The Spears Family Epsilon Epsilon Center For Exellence". Also, $500,000 of that nearly three million dollars was given to the Epsilon Epsilon Chapter itself to pay for the most recent renovation. Brother Spears also stays active by serving on boards of numerous civic organizations and financial institutions. Brother Jerry Ryan is the former President and CEO of Fintube Technologies, Inc., a heat transfer technologies company based out of Tulsa. Within a year of graduating from OSU, Brother Ryan developed the first worldwide application of radio frequency electricity to high speed welding of steel fins to steel tubes: greatly reducing the cost of welding. Brother Ryan created Fintube with three other Ep Ep brothers. As President and CEO, the company grew to 525 employees before its sale to Lone Star Steel in 2000. He then served on the Corporate Board of Directors for Lone Star before it was sold to U.S. Steel Corp. Brother Ryan has previously sat on the boards of publicly traded companies AAON and Global Energy, served on the executive boards of the Tulsa Opera and Philbrook Museum, and was named an "Honorary President" at Southern Hills Country Club. He currently sits on the Board of Directors for Emcor Group, a Connecticut based Fortune 500 Company specializing in construction and facilities service. Brother Burns Hargis has remained close to the Epsilon Epsilon Chapter since his active membership. Currently, Brother Hargis is serving as Oklahoma State University's 18th President. He is also the first chair for the Oklahoma Creativity Project. Before becoming president, Hargis practiced law in Oklahoma City for 28 years. He served as Vice Chairman of the Bank of Oklahoma, N.A. and is a former president of the Oklahoma County Bar Association, former president of the Oklahoma Bar Foundation, as well as, a Fellow of the American Bar Foundation. Hargis has fulfilled other honors during his career such as vice-chairman of the Oklahoma State Election Board, the Oklahoma Constitutional Revision Commission, and as Chairman of the Oklahoma Commission for Human Services. He also was a candidate for the Republican nomination for Governor of Oklahoma in 1990. Since 1965, Brother John Groendyke has dedicated almost his entire professional career to expanding and improving Groendyke Transport, Inc. Based in Enid, Oklahoma, Groendyke Transport, Inc. serves as one of the United States' largest tank truck transportation companies. The company currently operates 34 terminals in 12 states and hauls more than 420,000 loads of acids, lubricants, fuel, chemicals, vegetable oil and flour throughout the United States, Canada and Mexico. Brother Groendyke currently serves as Chairman of the Board and Chief Executive Officer of Groendyke Transport, Inc. and is actively involved in many of their subsidiaries. He was also elected to serve on the board of directors for OG&E Energy Corp. in 2003, which was ranked by Forbes as one of the 400 Best Big Companies. Groendyke was also inducted into the Oklahoma State Hall of Fame this February, the highest honor any alumnus of our alma mater could acheive. Brother Groendyke also serves on the board of directors for the Oklahoma State Fair. Brother Humphreys, a 1971 graduate with a Bachelor of Science in Industrial Engineering and Management is the former Senior Vice President and treasurer of Exxon Mobil Corp., as well as Exxon's Chief Financial Officer after retiring on February 1, 2013. He was also the Senior Vice President and Treasurer of ExxonMobil Chemical Company, a subsidiary of Exxon Mobil Corp. He served as Vice President of Exxon Mobil Corp. from 1997 to 2006 and served as Controller and Principal Accounting Officer of Exxon Mobil Corp., Vice President of Esso Malaysia Berhad and Controller and Vice President of Esso Production Malaysia Inc. which are also subsidiaries of Exxon Corp. In 1993, he moved to Kuala Lumpur, Malaysia, as Financial Director of the Exxon companies in Malaysia. He served as an Assistant Treasurer of Exxon Corporation since January 1997. Brother Humphreys serves on the Board of Governors of the Oklahoma State University Foundation and in 2007, he was named a Distinguished Alumni of OSU and was inducted into the Spears School of Business Hall of Fame. He also serves as a Director on the boards of Texas Parks and Wildlife Foundation. He is a member of Financial Executives International, the American Petroleum Institute and the Conference Board's Council of Financial Executives. He has served as a member of the Financial Accounting Standards Advisory Council and in the U.S. Army from 1972 to 1974. Brother Humphreys also has an M.B.A. from the Wharton School of Business at the University of Pennsylvania. Brother Coburn (R) is a doctor from Muskogee, Oklahoma who is currently serving as a United States Senator for Oklahoma. He is a member of the Senate Judiciary Committee, Homeland Security and Governmental Affairs Committee, Intelligence Committee, the Indian Affairs Committee and the Committee on Health, Education, Labor and Pensions. Prior to his election to the Senate, Dr. Coburn represented Oklahoma's Second Congressional District in the House of Representatives from 1995 through 2001. He was first elected in 1994, then re-elected in 1996 and 1998, becoming the first Republican to hold the seat for consecutive terms. In 1970, Dr. Coburn graduated with an accounting degree and as one of the Top Ten seniors in the Spears School of Business. While at college, Dr. Coburn served as president of the College of Business Student Council. A loyal brother of Sigma Nu Fraternity, Dr. Coburn has returned to the house frequently to meet with brothers and participate in events. His most recent visit was on April, 17 2008 during which he held a presentation to the active chapter involving Sigma Nu's National LEAD Program. Senator Coburn was recently recognized in 2013 as one of TIME Magazine's 100 most influential people in the world. Brother Carl Thoma of Chicago, Ill., earned his bachelor's degree in agricultural economics in 1970. He received a master's degree in business administration from Stanford's Graduate School of Business in 1973. Thoma is a managing partner in Thoma Bravo LLC, which manages $2.5 billion and was one of the early partnerships in private equity, launching its first fund in 1980. As an OSU stduent, Thoma represented the College of Agricultural Sciences on the Student Senate, was president of the Blue Key Honor Society, and was named toWho's Who. He also served as Lieutenant Commander (Vice President) of Sigma Nu. Thoma began his career in private equity with the First National Bank of Chicago. In 1980, he founded Thoma Bravo, LLC, which has invested more than $4 billion in growing companies over the past 35 years. Fortune, The Wall Street Journal and Business Week have cited Thoma for his investment leadership. He is most noted for his success in Pagenet, where his firm made more than 100 times its investment and secured numerous cellular licenses that are now a critical part of AT&t ceullular network. Thoma has served as chairman of the National Venture Capital Association and the Illinios Venture Capital Association, on the Boards of Copia, the American Center for Wine, Food, and the Arts, Northwestern Evanston Hospital and the Illinois Institution of Technology. Thoma is actively involved on the advisory councils of the Stanford Graduate School of Business and the Illinois and National Venture Capital Associatoins. He was inducted ino the Chicago Area Entrepreneurship Hall of Fame in 1998 and was named by the Illinois Venture Capital Association as the first recipient of the Stanley C. Golder Award as a leading venture capitalist in Illinois. He reamins involved at OSU, serving currently on the Riata Center for Entrepreneurship advisory board and during the late 1990s on the Oklahoma Higher Education Regents Committee for the evaluation of state colleges. The Spears School of Business inducted him into its Hall of Fame in 1996, and in 2002 he received the OSU Distinguished Alumni Award. Brother Thoma is a life member of the OSU Alumni Association. Brother Eitel served as Chairman and Chief Executive Officer of The Simmons Bedding Company from January 2000 through 2008. Simmons Bedding Company is one of the world's largest suppliers of mattresses that operates 18 manufacturing plants in the United States and holds 23 international licenses and sub-licenses. Charlie Eitel has worked for a number of companies in various capacities, including, but not limited to, president, chief operating officer, and other similar roles. Brother Eitel now serves as the Vice Chairman, currently sits on the board of directors of The Simmons Bedding Company and served on the board of directors of American Fidelity Assurance until December 31, 2008. He now serves in an advisory capacity for the board of directors of American Fidelity Assurance. Charlie has also served as a director of the Company since 1999. In 2008, Brother Charlie Eitel became the 46th person since 1869 to be inducted into the Sigma Nu Hall of Fame. He was inducted along with Super Bowl Champion and MVP Eli Manning, as well as, World Series Winning MLB Manager George "Dallas" Green. Brother Eitel has just finished serving his term as Regent, which is the highest position a Sigma Nu can hold nationally. Brother Dave Kollman currently serves as lead the Tulsa and Albuquerque Divisions of Flintco Companies Inc. as well as serving as the executive vice president on the companies board. This nationwide company ranks among the largest of commercial contractors, was voted best company to work for, and was voted best people to work for you in recent polls. Dave will work with other members of Flintco's executive management team to develop and implement direction and growth strategies, officials said. Kollman will also continue to oversee the management of the company's operations in Tulsa and Springfield, Mo., and its sister construction company, Oakridge Builders. Dave has had an incredible influence here on campus and within Flintco's own rankings. One notable project Dave worked on was the renovations done to Lewis Field at Boone Pickens Stadium. Brother Newcomb is currently serving as a Senior Advisor to the CEO of Oakley, Inc. His previous positions held at Oakley, Inc., since 1994, include Vice President of International Sales and Chief Operating Officer which he held from 1999-2006. From 1997-1999 he served as CEO and for about two years before 1997 he held the position of CFO. Oakley is a worldwide leader in performance optics including premium sunglasses, goggles and prescription eye wear. Brother Newcomb graduated from OSU in just four years with a Bachelor's and Master's Degree in Accounting. After his time spent at OSU and Sigma Nu, Newcomb would work for a year before going back to school where he would obtain a law degree from the University of Texas. Link would then work as a corporate attorney for one of the largest law firms in the U.S. According to the current CEO Scott Olivet, "Link played an integral role building Oakley into one of the world's most respected brands and companies." Considered by TIME Magazine as one of the top 50 sports executives in the world, Robert Canterbury Buford has lead the San Antonio Spurs to three NBA titles as General Manager and contributed to another NBA title while holding other positions within the organization such as Director of Scouting and Vice President/Assistant General Manager. Brother Buford was crucial in acquiring Tim Duncan and Frenchman Tony Parker and either championed or discovered Robert Horry and Bruce Bowen. While an active brother, Buford played basketball for the Oklahoma State Cowboys and after college was a member of the Kansas Jayhawks coaching staff that won the 1988 National Title. Brother Buford is also currently serving as the president of sports franchises for Spurs Sports and Entertainment. In 2005, Brother Eubank was appointed by the New York Stock Exchange as the Vice President, Global Affairs. Still holding that position today, Jeffrey Eubank manages relationships between the NYSE and government policy makers around the world. From 2001-2005, Brother Eubank served as Deputy U.S. Chief of Protocol in the administration of President George W. Bush. Before moving to Washington D.C., he served as Assistant Texas Secretary of State under Governor Bush. After graduation from OSU, Brother Eubank would graduate with a law degree from the University of Oklahoma and receive a Masters of Law from the University of Edinburgh, Scotland. Jeffrey Eubank's current duties include managing relationships between the NYSE and government policy makers around the world, including heads of state, finance ministers, cabinet officials, ambassadors and consuls generals. He is also responsible for coordinating visits to the Exchange by key international leaders and supporting trips abroad by NYSE CEO John A. Thain. Brother Jeff Wood is an award winning country music singer/songwriter who currently resides in Nashville, Tennessee. During his career he has opened up for Lee Ann Rimes, Martina McBride, Wynonna, Vince Gill and Blackhawk. He is best known for writing the #1 hit song "Cowboy Love" which was recorded by John Michael Montgomery and a main contribution to the Album John Michael Montgomery which sold over 7 million albums. Jeff Wood has also performed on national television numerous times on shows such as Kathie Lee Gifford's CBS Christmas Special, TNN's show "Nashville Now" with Gary Chapman and "Ricky Skaggs Monday Night Concerts" on TNN at the Ryman Auditorium (which was the original and long-time home of the Grand Ole Opry). In his debut album "Between the Stars" he also had 3 top 50 hits. While a Sigma Nu at OSU Jeff Wood played at Wild Willies Saloon (which is a mere 200 yards from the Sigma Nu chapter house) with Garth Brooks when they were both "just playing for tips." Another great memory of Jeff's would be the weeks he spent in France on a writing retreat hosted by Miles Copeland (the manager of The Police and Sting). There, he played alongside Keith Urban, Olivia Newton John and Peter Frampton, all of whom were in attendance. On top of these great accomplishments, Jeff earned the honor of Alpha status as a senior at OSU, which is given to the top ten seniors internationally by Sigma Nu Fraternity. Brother David Duncan is executive vice president of INVISTA. He is responsible for INVISTA’s downstream businesses: Apparel, Interiors and Performance Materials. INVISTA, based in Wichita, Kansas, is an independently managed, wholly owned subsidiary of Koch Industries, Inc., the world’s largest privately held company, according to Forbes. Koch companies have a presence in nearly 60 countries and employ about 80,000 people. Prior to this role, Brother Duncan served as chief financial officer for the Koch Mineral Services group of companies, which includes Koch Carbon, Koch Nitrogen, and Koch Exploration and Production, and other strategic investments. After joining Koch in 1997, he served as a managing director of Koch Ventures and Koch Equity Development, Koch’s merger and acquisition group. In the latter role, he was a leader of the INVISTA acquisition and transition team. Brother Duncan then joined INVISTA as vice president after the 2004 purchase before moving into his role at Koch Minerals Services. Prior to his time at Koch, David worked in the banking industry. He received his M.B.A. from Indiana University and his undergraduate degree in finance from Oklahoma State University. Brother Griff Jones is a Co-Founder and Chief Executive Officer of Eagle Energy I, L.P. Eagle Energy is a Houston-based company that engages in the acquisition, management, and delivery of natural gas and electric power in the United States and Canada. Its services include a trading floor with 24/7 trading and scheduling; gas and power marketing; load and asset management; storage management; hedging services; transportation and transmission management; and long-term optimization through the management of fuels and forward contracts. Eagle Energy is one of the largest providers of market services to the wholesale gas and power sectors in North America and Canada specializing in energy logistics and asset optimization. Brother Kevin Vann was recently announced as the Senior Vice President and Chief Financial Officer of WPX Energy. WPX is a publicly traded natural gas produce based out of the Tulsa area. Brother Vann has 20 years of financial and accounting experience, almost entirely in support of oil and gas companies and activity. He has a background in public accounting, beginning his career with Arthur Andersen in 1993.Prior to becoming Sr. VP & CFO at WPX, Brother Vann most recently was VP, Controller and Chief Accounting Officer. He came to WPX via the spinoff from Williams, where he served for 14 years in various roles, including Controller for the E&P and Power businesses, as well as accounting director and manager of risk assessment and analysis. A native of Sand Springs, Okla., Brother Vann is a member of the Oklahoma State Accounting Alumni Council. He has served on the Board for Youth Services of Tulsa, as well as the Advisory Council for the American Lung Association. Brother Kuehne is currently a golfer on the PGA tour and Nationwide Tour. He was the 1998 U.S. Amateur Champion and won honors as a three-time All-American in college while on the golf team. Brother Kuehne also played on the U.S. Eisenhower Trophy team. The Eisenhower Trophy Championship is a biennial world amateur team golf championship for men organized by the International Golf Federation. His best finishes on the PGA tour include multiple finishes for 2nd place, as well as winning the Tour's Drive Distance Title in 2003, unseating John Daly who had won the previous 8 titles. He is currently sponsored by Callaway Golf and J. Lindeberg Clothing and was previously sponsored by Top Flite and Ben Hogan. Our alumni are continuously finding success and raising the expectations for Sigma Nu brothers across the nation. Former Regent of Sigma Nu and Epsilon Epsilon brother Ike Glass was recently inducted into the Oklahoma Hall of Fame, While News 9 anchor and Epsilon Epsilon brother Kelly Ogle from Oklahoma City was declared a Distinguished Alumni by OSU in 2008. Epsilon Epsilon brother Wes Holmes is currenty serving as OSU Alumni Association President of the Tulsa Chapter. Furthermore, the current Regent, which is the highest position one can hold nationally, is Epsilon Epsilon Alumnus Joe Francis. He and brother Charlie Eitel are the first regents from the same chapter to serve back to back.